I grew up athletic, but due to poor eating habits, I was always heavy & self-conscious. Furthermore, heart disease, diabetes, high triglycerides, & migraines ran in my family. By learning about nutrition and exercise, I began to understand the importance of a healthy eating & fitness regimen. In college, I lost over 50 pounds and I have never felt better mentally, physically, and emotionally. After years of helping friends & family lose weight and get healthy, I have expanded my reach and now work with individuals and groups across Tennessee and the Southeast. From one-on-one to large events, my passion is helping everyone look good and feel even better! 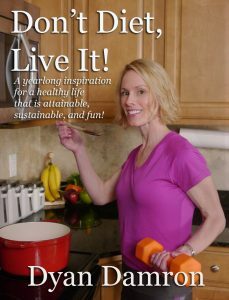 My book offers an entire year’s worth of inspirational stories, tips, and recipes. There is a chapter for each month that includes seasonal motivation and recipes. No matter what day you decide to make a change, you can pick up this book and get started! You will soon be enjoying a healthy life that is attainable, sustainable, and fun! You can purchase on Amazon or contact me to get your personally signed copy – or have a signed copy sent as a gift! Being physically fit and eating nutritiously will make you feel better and have more energy to enjoy life. I truly feel that lack of awareness and education about nutrition and exercise – added to our lack of time and motivation – is leading to our unhealthy society. I can help you make small changes in your lifestyle to help you look and feel better. I will offer tips on shopping for groceries, cooking and preparing meals, scheduling exercise, plus much more…kids included! I will help you live a healthy life that is attainable, sustainable, & fun!